You know what was great about today? Crashing 4 km into a 132 km race. In the neutral start. You know what was even better! Having my derailleur ripped off and shifter broken in this crash. Thank goodness that our one spare bike happened to be set up with my pedals and saddle height! Sigh, The Drenthe World cup seems to always be a crazy race, and this is only my second year doing it. I was quite prepared for surprises after last year’s start. Last year involved riding from a warehouse and passing through a shopping mall complete with a red carpet in order to reach the actual start line. Then bikes were thrown everywhere as everyone raced to sign in to get to the actual start line in a good position. Definitely the most creative neutral start I’ve ever experienced. I went in this year expecting some sort of craziness and it didn’t disappoint. The hardest part was finding where to start! I couldn’t help but think that we were at some sort of circus, circling aimlessly at the start line figuring out where to go, all while hundreds of motorbikes revved their engines, people walked everywhere, and the marching band played their tunes. We did eventually find where to go. Apparently all the teams had to do a team presentation inside one of the buildings, then go outside, sign in, then line up. Quite a few teams figured this out before us so we were one of the last ones to line up. The race is really well run and supported by the town, it’s just that all the extra formalities can be extremely confusing! Next up was the crazy neutral start with my unfortunate crash. One of the girls who saw from behind said it happened when the group swerved over to avoid a car on the side of the road. Sometimes crashing is a bit unavoidable. In any case, I hopped onto the neutral bike, wiped away my tears of frustration and rejoined the battle. I could definitely feel the fatigue from the past few races in my legs today. I was sitting wayyyy too far back in the bunch, but just didn’t have the energy to propel myself through the group. It makes me realize that my position in the pack actually hasn’t been all that bad in the past few races. The back is awful, braking from the front of the pack gets amplified x100, and you get caught behind every single crash. I have made it a goal to not ride any more races back there! The course featured three climbs up an old garbage dump. The first one 10 km in, and then two later on in the finishing circuits (really just the same “hill” backwards). There were also three distinct cobble sections after around 50 km. I knew that nothing would stay away after the first hill, but that the cobbles would probably determine most of the race. First cobbles were good, stayed with the group. Second cobbles were hard, 2.5 km of pain. I left these just a bit off the back of the group. It took a little while of chasing with a few other girls and weaving through the caravan, but we made it back to the group! Third cobbles, not so great, 2 more km of pain. It was this section that really broke up the race and I found myself in a smallish group of 20. Our group slowly grew as we caught people/ were joined by people chasing. 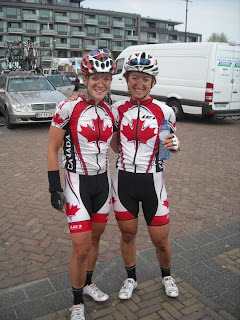 Three of the other Canadian girls fought hard through the cobbles, but didn’t quite make it through with a group. Leah G. ended up in the same group as myself, it was nice to have some company! We rode most of the rest of the race in this group. Our group surprisingly came back in contact with the front before the 2nd climb, but then it separated again after the climb. It sort of did this a few times, but then the pace quickened and distinct groups formed. I was pretty darn tired at the end of the race.. longest last 25 km ever! The fans out watching, and helicopter out videotaping were good motivation nearing the end. Marianne Vos won the final sprint (wow she is fast!). I rolled in 85/155 starters. 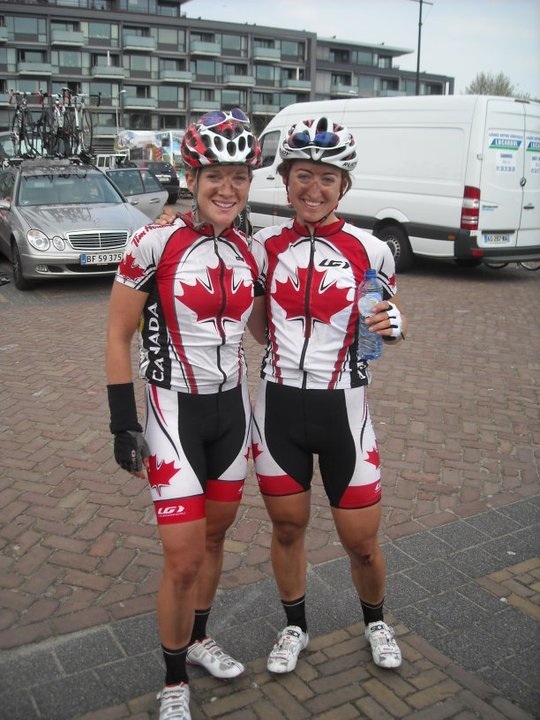 Managed to finish my second world cup (Flanders was the first), so at least that's pretty cool! We get to do it all again tomorrow. 140 km of Ronde van Gelderland, starting from the track where Worlds just took place (where Tara Whitten won her omnium Gold!). Anyways, this post is turning into a novel so I’m going to stop now!